The Frontier Explorer has acquired the Star Frontiersman magazine. About two months ago I was contacted by Bill Logan, the creator of the Star Frontiersman magazine, and asked if I would be interested in taking over management of the magazine. His work with DwD Studios takes up all his free time and he just doesn't have the time to devote to the magazine that it deserves and didn't want to see it die. I gladly accepted it and have been working on a new web site for the Star Frontiersman and getting everything ready and transfered. That process effectively completed on Monday. You can read the details about the magazine and change of management and download any past issues you're missing at the new web site. Submissions for both magazines will be handled through the submission form on this site. If you have a strong preference on which magazne your content appears in please let us know in your submission comments. We're quite excited about this development and hope you enjoy both magazines from here on out. Issue 9 is now available for download. This issue is all about spaceships. We have a couple of awesome deck plan by Joseph Meager that we rescued from a lost Star Frontiers site. Plus submissions from some regular contributiors and a cargo ship by a new author, M. Derryberry. In all, there are three sets of deck plans, a writeup on a fourth class of ships, some space stations, and a review of early atomic rockets. We also have a new system brief and the continuing adventures of Jurak Hangna and Grymz, as well as a bit of Yazirian legend related by Alex Stone. We even found room to squeeze in some new equipment, more pages of the Titan Rising: 2299 comic, and some Knight Hawks encounters. We are really excited about the image on the cover. The Assault Scout model used to make the cover was created by a talented Fronteirsman named Jay Thrurman. Look to see more done with this and other models he's created in future issues. The Sathar! They have repeatedly invaded the Frontier and their deadly red ships have always remained a mystery. Rumors abound that top secret UPF files exist giving details on sathar ship interiors and details of the sathar culture and military. No UPF official has ever admitted to the existence of this information. Now, The Frontier Explorer presents to citizens of the Frontier the deck plans of a sathar destroyer. These plans were recently declassified from Starfleet records and represent data obtained from an undetonated derelict ship found drifting since the First Sathar War. These plans reveal the true alienness of these creatures and underscore the terror that these ships should instill in all Frontier citizens. 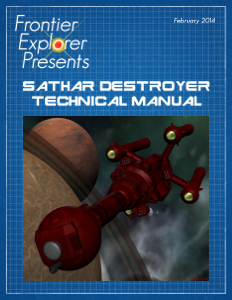 The Sathar Destroyer Technical Manual is the first of the Frontier Explorer Presents series. The Frontier Explorer Presents series is our collection of special issues and will contain materials that doesn't fit in the magazine format or requires a speical presentation of its own. This 30 page document contains complete maps and descriptions of the interior of the sathar destroyer, the most common sathar vessel found in the Star Frontiers game. It also includes information on the the philosophy of the ship's design and cultural elements about the sathar to allow game masters to develop similar plans for other ships. While the sathar are specific to Star Frontiers, this ship and deck plans can be easily adapated for use in other game systems. In addition to the PDF with the ship descriptions, there are two map download files in the Hi-Res Downloads Maps section. These downloads include two sets of full scale maps. Both sets were produced at 100dpi and have a scale of 1 half inch (50 pixels) = 1 meter. The first set has a half inch square grid superimposed on it and is designed to be printed and used for tabletop play with miniatures or the counters provided in the Star Frontiers game. The second set is identical but has had the grid removed to be used with virtual tabletop game systems. As is true with all the Frontier Explorer products, and per our agreement with Wizards of the Coast in creating Star Frontiers material, this download is completely free. But while we can't charge for our products, we are allowed to accept donations and “tips” from interested users. If you like what you've seen in the published issues of the Frontier Explorer magazine and want to help keep it going, consider making a donation when you download this title by clicking the "Donate" button at the bottom of the left sidebar. All donations go toward maintaining the magazine's website and producing the magazine and special issues. We hope you enjoy this special Frontier Explorer Presents issue. As always, keep exploring! The Sathar Destroyer Technical Manual is also available on DriveThruRPG. Work, holidays, and vacations caused a bit of hassle with this issue so we're a bit behind in getting it out and getting the HTML version on-line. Bear with us as we finish it up. The PDF version, which is how most of our readers get the content is ready for download however. So don't wait. Grab your copy today and check out all the new material. And as always, keep exploring! The Sathar are coming! 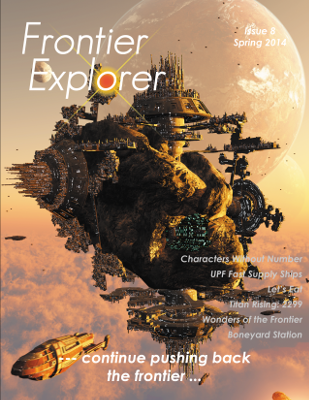 Issue 6 of the Frontier Explorer is now available for download. This issue focuses on the Sathar and provides a wealth of information on how to integrate the sathar into your campaign. Most of the content is rules agnostic and would allow the inclusion of the sathar regardless of the game system. Articles include information on sathar society and military organization, an adventure introducing a possible sathar defector, a look at possible interactions with the sathar and the megacorps, and a look at hypnotism. We also introduce the first of a series of articles looking at converting Star Frontiers material to the Stars Without Number game system. In this issue we look at converting the sathar attack monsters. We also had a complete set of deck plans for a sathar destroyer but it just wouldn't fit. Look for it coming out as a special "Frontier Explorer Presents" issue in the next month or so. The print edition of issue 5 is now available through the Issue 5 product page on DriveThruRPG. If you're interested in a print copy, jump over there and grab yourself one. Issue 5 of the Frontier Explorer is now available for download. This issue provides a smorgasbord of articles from our submission queue on a variety of topics. We have several articles on gaming tips for both players and game masters to help make the game engaging and relevant to the players regardless of the game you play. There is new equipment as well as small cultural write-ups on a couple of the Star Frontier races. This issue includes a clean, redrawn version of the classic Assault Scout deck plans as well as an initial look at variations on that ship, and a solo adventure that uses those deck plans. We also delve into the internet archive to resurrect some lost material on a new Mega-corp and optional rules for dealing with the expenses of owning a starship. There is also a short story by another new fiction author, that takes place in a new setting. Issue 5 is almost done. We've released the subscriber preview and are working on getting all the on-line content ready to go as well as putting together the print edition. This issue has a variety of content including tips for GMs and players, a solo Star Frontiers adventure, remastered deck plans of the classic Star Frontiers ship the Assault Scout and many other great articles. Look for issue 5 to become publicly available in the middle of next week.